Set in the quiet town of Stanford, in a beautiful garden, Marianas is a little restaurant that has a lot to offer. Run by Mariana and her husband Peter you are guaranteed excellent attention and real home cooked food. The wine list has a lovely variety of local wines that are well priced and use the Platter rating as a guide. Included on the list is a ‘house’ wine that is superior and worth sampling. The menu changes often and is written up on a chalk board – starters and mains on one board and desserts on another. The meals are varied and there will be something to cater for all tastes. 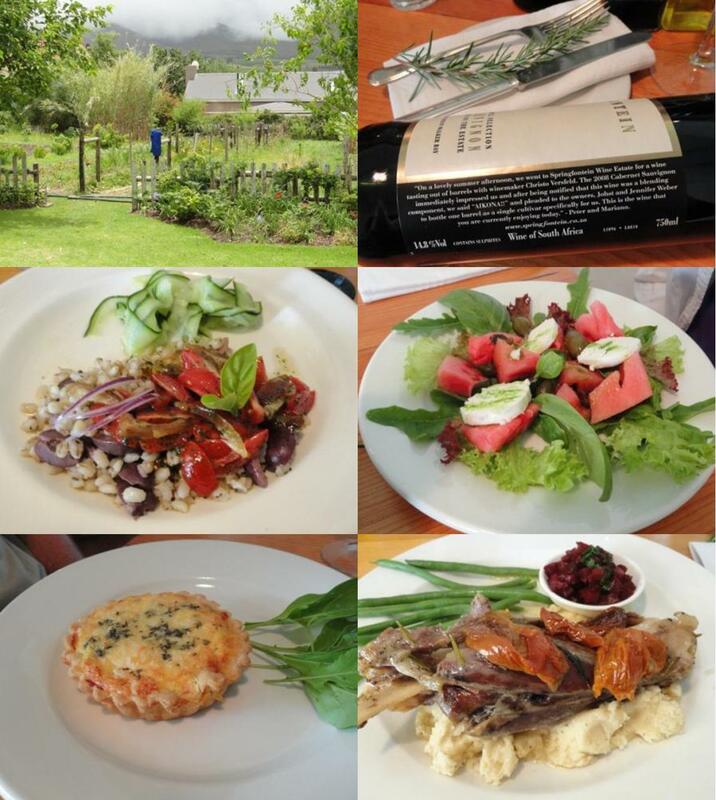 Out of the 4 starters (R36 – R42) we chose two barley salads, a melon salad and a gruyere tart. For mains we chose fish curry, springbok pie and skaap en dinges (sheep and ‘things’, being vegetables). 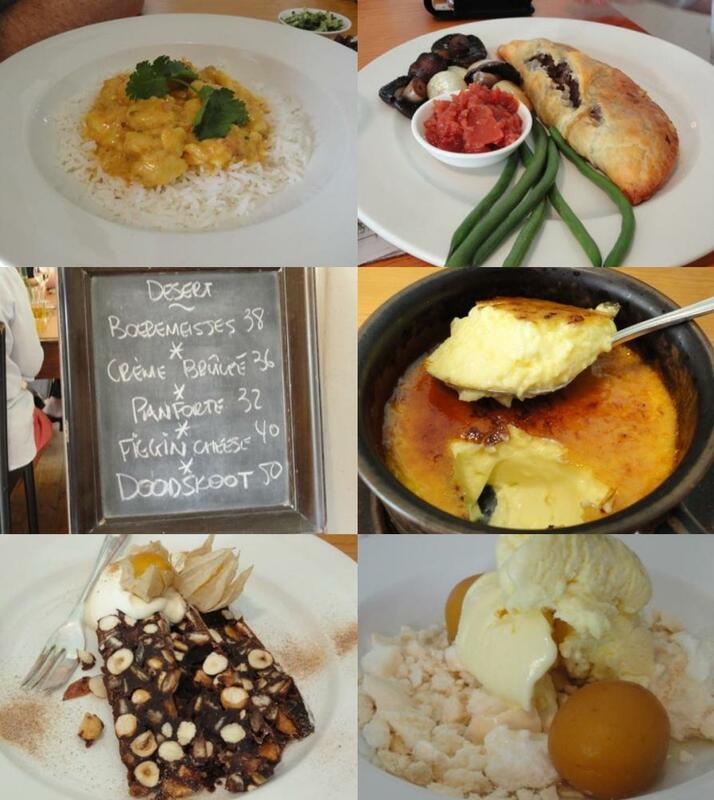 The 6 main courses ranged from R85 – R110. We were given the choice of 5 desserts (R32 – R50) and my mom has boeremeises (the word is very similar to the Yiddish bobbameises which means fairy tails). I off course had the crème brûlée. My dad had the panforte and Dave had the figgin cheese (figs and cheese). This venue is perfect for a get away meal – and if you chose to have supper there, be sure to book into one of the local B&B’s as the drive back is not that pleasant at night. I thoroughly enjoy your review posts! Wonder if I will ever get to visit any one of these lovely establishments – here’s crossing fingers and toes. Thanks for showcasing such a wonderful restaurant. I’ll be sure to keep it on my list to do when in the area. Lovely mini-break stop.